Only one person knows what happened to Mike’s dad, and no one knows where he is. All Mike remembers about the day his dad died was the phone call that his mother received telling them that Sergeant Mark Wilson had been shot and killed in combat. At the funeral, military war veterans had walked by and patted Mike’s back, telling him that his father was a good man. Mike didn’t care about any of that; all he wanted was his father back. Then, mysteriously on Mike’s 16th birthday, he received a strange letter addressed by his dad. “If you’re reading this, then I’m very sorry, but I didn’t make it home. I was killed in the war in Afghanistan.” Mike was in shock, and he didn’t believe that it really was his father who had written the message. But as he was reading it, he realized that it really was from his father, as he mentioned things like trips that only his father would know. He began to wonder who sent him the message, since his father was dead. But when the second message arrived, Mike’s dad mentioned a man name Ortiz, who was instructed to deliver the messages. Shortly after the second letter, the football team at Mike’s high school offered him a spot, even though tryouts already happened. Mike needs a parent signature to play, but he knows his mom will never allow him to play. In the upcoming days during If You’re Reading This, Mike receives numerous letters from his late father, and while trying to find who is sending these letters, he does his best to conceal the fact he is playing football. If You’re Reading This, by Trent Reedy is an inspiring book about a boy that has a rough childhood and struggles to find out what is most important to him. 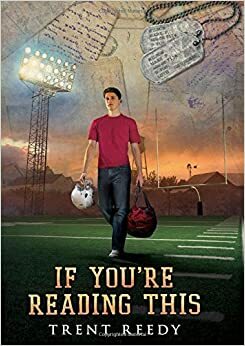 While being bullied, dealing with mystery letters from his dad, and playing football secretly, Mike must learn to find what is most important to him. I really enjoyed this book because the author made it seem very realistic, and made connections with me as I read it. I loved the intense football action scenes, but reading about Mike struggling through hard times was saddening. I felt as if I was on the field, cheering for Mike to go all the way, to score a touchdown. Trent Reedy creates a masterpiece that will allow everyone to be next to Mike every step of the way. This book is perfect for those who are into action, tragedy, and mystery. I would especially recommend this to anyone who likes realistic fiction, for it is a great read for everyone. But how will Mike cope with the days ahead of him?